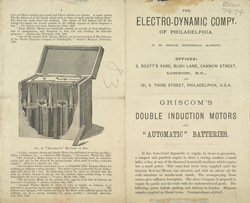 The Electro-Dynamic Company of Philadelphia was a merger of two smaller companies owned by Frank Cable and Isaac Rice, respectively. Under Rice, the Electro-Dynamic Company manufactured and supplied the batteries for the legendary Holland VI submarine. Rice would later buy up the Holland Torpedo Company, merging it into his empire as the Electric Boat Company.